As a host or hostess, many times you don’t have the resources, or the time, to create everything from scratch. And guess what…? There are no rules that say you have to bake a mean casserole, poach a perfect egg, or whip up a demi glaze to entertain guests. (Shocking, right?!). Entertaining is about the company, the memories, and the experience. People will remember the event, not the twenty hours you slaved away in the kitchen to create it. So give yourself a break. Don’t let Pinterest and the web scare you into thinking that you have to be a great cook to have a dinner party. It’s totally acceptable to go the semi-homemade (or even store bought!) route! Sande Lee would be happy with today’s semi-homemade recipe that’s perfect for autumn nights, pupmkin carving parties, or just for a yummy meal with the fam. 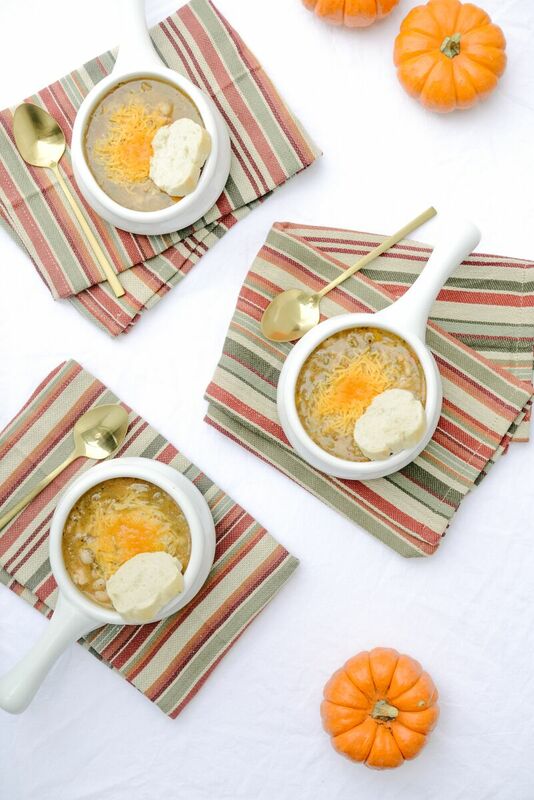 I’m sharing a recipe for white bean chicken chili that is oh, so yummy and a cinch to make too!